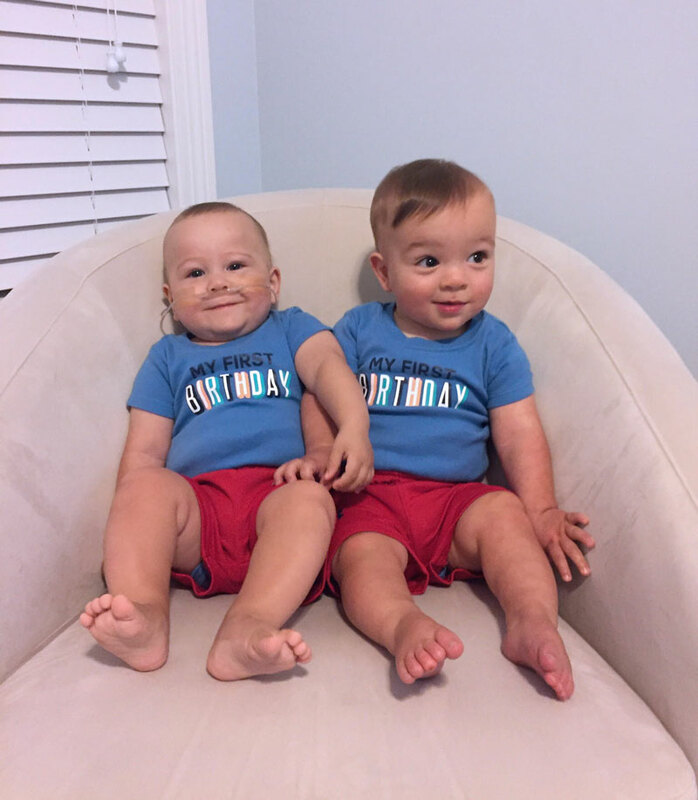 Twins Grant and Connor Orendorf celebrated their first birthday after a long, emotional NICU journey. When Katie Koblenzer Orendorf woke up on July 26, 2016 with sharp pains, she thought she had pulled her back golfing the day before. Luckily she went to Cleveland Clinic Akron General because, at 26 weeks pregnant with twins, she was going into labor. A hospital resident told her they were going to administer a shot to stop labor, but Katie’s placenta ruptured. Her obstetrician immediately came in, looked at her and called an emergency. 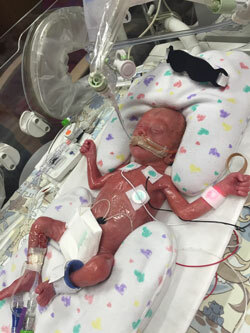 Connor was born first at 2 lb. 5 oz. Less than 10 minutes later, the first twin, Connor, was born at 2 lb. 5 oz. His brother, Grant, followed a few minutes later at 1 lb. 15 oz. 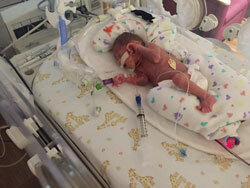 The twins were immediately taken to Akron Children’s Hospital’s Neonatal Intensive Care Unit (NICU). That started a long and emotional NICU journey for the Orendorf family. Connor spent 83 days in the NICU and was released in October after Dr. Tsulee Chen, director of pediatric neurosurgery, placed a shunt in his brain to relieve pressure and fluid. His brother Grant had a long road ahead of him. Grant was born second at 1 lb. 5 oz. Dr. Anand Kantak, director of neonatology, and the family’s nurses asked Katie and Harrison to be patient. They were hopeful that with time they could avoid a tracheostomy procedure. The NICU team’s belief that Grant’s lungs just needed to get stronger proved to be true and, finally, in March, Grant was able to go home on minimal oxygen and a feeding tube. Grant is still on a feeding tube and is being weaned off oxygen, but Katie said it’s a true miracle that both boys are home, happy and healthy. The family celebrated the twins’ health and happiness when the boys turned 1 this July, surrounded by friends, family and NICU staff members. Some of Grant and Connor’s NICU nurses came to the twins’ first birthday to celebrate with the family. 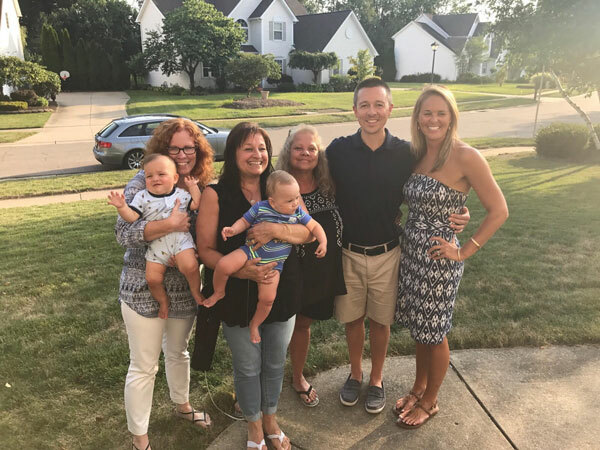 The twins’ grandfather, Dale Koblenzer, expressed the family’s happiness and gratitude surrounding his grandsons’ first birthday in an email to Akron Children’s CEO Bill Considine.